THE GOOD: With an innovative torque-vectoring, gasoline-electric hybrid power train, the 2018 Acura RLX Sport Hybrid gets plenty of power and impressive handling, while achieving excellent fuel economy. It drives quietly and comfortably, with lane-keeping assist that centers it on the road. THE BAD: The navigation system, with its slow inputs and clunky interface, is an exercise in frustration, and the lack of Apple CarPlay or Android Auto doesn’t help. Adaptive cruise control feels too sensitive in heavy traffic. THE BOTTOM LINE: Acura packs the 2018 RLX Sport Hybrid with impressive features and a cutting-edge power train, making it a very good value, and it would be a truly excellent sedan if it had better cabin electronics. As the 2018 Acura RLX Sport Hybrid slews around tight turns on Malibu canyon roads in Southern California, I look for any hint that the sedan’s active torque vectoring improves the handling. I don’t feel any surprising rotation when I twist the wheel around, or the back end moving around more quickly than I might expect. But after quite a bit of adrenaline-pumping fun, I realize that the RLX Sport Hybrid handles the corners with much more composure than it should. No understeer, just an easy and predictable path through the turns even with the tires squealing, testament to Acura engineers’ fine-tuning of the RLX Sport Hybrid’s all-wheel-drive system. Of course, few buyers of a big sedan like this one will tackle the turns at speed. Equally good news for that more typical driver is that, after seven hours on the freeway, I felt very little fatigue. The RLX Sport Hybrid lulled me with its comfortable seats and suspension, and its quiet cabin. Acura gave the RLX Sport Hybrid a bit of a refresh for the 2018 model year, with “all-new sheet metal from the A pillars forward,” according to Acura spokesman Matt Sloustcher. That update improves the looks, but doesn’t do much for the often frustrating dashboard electronics, including the navigation and stereo interface. The sedan also shows Acura’s limitations as a premium brand, in that the RLX, its top car, competes in the midsize segment, against the likes of the Mercedes-Benz E-Class, Lexus GS and Audi A6. Acura still doesn’t put it cars up against large sedans, such as the Lexus LS or Mercedes-Benz S-Class. As it is, however, the cabin of the RLX Sport Hybrid feels quite roomy, with loads of legroom for rear-seat passengers. White upholstery, with matching dashboard, wheel and door panels, looks very good accented by glossy wood trim. The console carries push-button drive controls — no retro shifter in this modern car — and a single USB port. What doesn’t work for me is the RLX Sport Hybrid’s upper LCD and lower touchscreen, with a dial and button pod below further confusing the issue of how to control the infotainment system. Entering destinations for navigation or programming music becomes very convoluted, with duplicative functions and different control interfaces. The maps showing on the upper LCD look crude compared with the competition. Although I was initially pleased to find a keyboard on the touchscreen for destination entry, the slow response time from the system killed the experience, making it more frustrating. Worse, rather than one-box entry, I had to enter city and street separately for addresses. The only upside to this navigation system is an online search option that works for finding businesses by keyword. The RLX Sport Hybrid’s head-up display provided navigation assistance, showing directions for upcoming turns. However, Acura chose to have it display the car’s power train, rather than driver assist information, such as cruise control set speed or following distance. Not to say that the RLX Sport Hybrid’s power train isn’t impressive. The system relies on a direct-injection 3.5-liter V6 to drive the front wheels, and dual electric motors at the rear wheels. It’s similar to the system in the MDX Sport Hybrid SUV, and a mirror image of that in the NSX, where the electric motors drive the front wheels and the gasoline engine is at the rear. By itself, the RLX Sport Hybrid’s gasoline engine manages 310 horsepower and 272 pound-feet of torque. 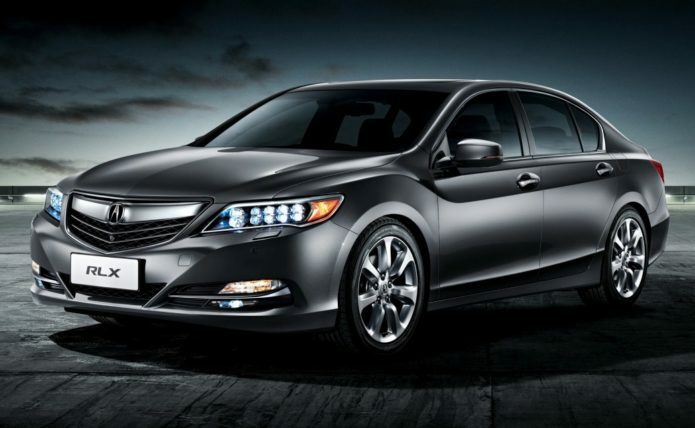 Add in the electric motors, and Acura puts the total output at 377 horsepower and 341 pound-feet of torque. Power output isn’t the most interesting part of the story, as Acura tuned the system to make the rear electric motors exert positive or negative torque to assist handling. For example, power into a turn and twist the wheel, and the system drives the outside rear wheel harder than the inside one to defeat understeer. In my experience, the RLX Sport Hybrid’s torque vectoring resulted in very accurate and comfortable cornering. Despite the fixed suspension, the power train helped to minimize body roll. As with the NSX, the RLX Sport Hybrid also gets a quick-shifting seven-speed dual-clutch automatic transmission. Using the paddle shifters, I could feel the snappy gear changes when I chose to use it, but found its automated shifting to be programmed very well for performance driving or everyday use. As a quirk of that transmission, the car will roll back when stopped on hills, but Acura helps out with a brake hold function, so I didn’t even need to keep my foot on the brake when stopped. On canyon roads and city streets, I find the car’s steering responsive and accurate, with good heft. It falls into the Cinderella range, not too twitchy and not too vague. While the RLX Sport Hybrid’s cabin mutes outside noise well, stepping into the throttle lets a gratifying growl from the engine through, relating action and sound. As a hybrid, the car shuts down its engine during traffic stops and cruises under electric power under certain circumstances, but it always proves ready to go when the light turns green. Acura uses the hybrid drivetrain to give the RLX Sport Hybrid excellent all-wheel drive, but it also serves the cause of fuel economy. It achieves 28 mpg in the city and 29 mpg highway under EPA testing. After a long highway run, I managed to maintain 29 mpg while driving in the city, pretty impressive given the car’s size and power. I made extensive use of the RLX Sport Hybrid’s adaptive cruise control and lane-keeping assist, although the results were mixed. Adaptive cruise control, which uses a radar to match speeds with slower cars ahead, felt a little too sensitive in heavy traffic, responding to minute changes in traffic speed. Although the system works in stop-and-go traffic, bringing the RLX Sport Hybrid to a full stop, I tended to cancel it at slow speeds due to its behavior. At high speed on the freeway, I found it perfectly comfortable. Lane keeping, where the steering automatically adjusts to keep the car in its lane, worked very well. The system kept the RLX Sport Hybrid well centered between the lane lines, and could almost steer the car itself. For liability reasons, the car flashes a warning if it doesn’t detect hands on the wheel over a set amount of time. To prevent or mitigate crashes, the RLX Sport Hybrid flashes a warning on its head-up display if it detects a potential collision. If the driver doesn’t take any action, it will automatically hit the brakes. Shopping for a 2018 Acura RLX Sport Hybrid is dead easy. There are no options or packages to choose from, as Acura makes this a mono-spec model, with navigation, hybrid all-wheel drive and even a HUD all for $61,900, with a $965 delivery fee. You could step down to the front-wheel-drive standard RLX model, which goes for $54,900, but the hybrid includes so many features, while delivering more power and getting much better fuel economy, it’s kind of a no-brainer. While there’s quite a bit to like in the RLX Sport Hybrid, the cabin electronics are inferior to the competition, and lack support for Apple CarPlay and Android Auto, which would mitigate the problems. If the poor interface and functionality would drive you nuts, consider the BMW 5 Series or Audi A6, both of which offer compelling connected infotainment systems. In fact, as a plug-in hybrid, the BMW 530e is an impressive option, although down on power compared with the RLX Sport Hybrid. The Mercedes-Benz E-Class includes more impressive driver assist features, but its turbocharged four-cylinder engine doesn’t really compete. A more direct competitor is the Lexus GS 450h, but it costs more and doesn’t offer as much power.